Haley Heynderickx's highly anticipated debut album is streaming on NPR Music who interviewed Heynderickx on her debut and her process. Speaking to the time between her debut EP and the album Heynderickx says she "wanted it to feel intimate. It feels like a conversation to me, getting to play a show. And now making a show for an invisible person, I have no idea how people can intake and receive music without the external stimuli [of a live performance]. It felt like a different craft, so it took me a long time." Stereogum's Tom Breihan praised Heynderickx and I Need To Sart A Garden saying "Heynderickx is the sort of virtuoso who puts her gifts toward making richer, more intricate, more deeply felt music" and Brooklyn Vegan said "Haley has gotten a lot of Angel Olsen comparisons, and they definitely have a similar sound, but Haley is a force of her own." Heynderickx's highly anticipated debut album is out in a week, on March 2nd, and you can head over to this private page to find more information and check the private download or album stream. Haley will be heading down to SXSW, stopping in LA on the way, and playing She Shreds, Brooklyn Vegan and more showcases on top of her official with Turntable Kitchen. Stereogum called Haley Heynderickx an Artist To Watch with an interview between Heynderickx and Stephen Deusner who called "Untitled God Song" a "deeply contemplative, occasionally hilarious, spiritually provocative meditation into the nature of the Woman Upstairs." Deusner goes on to praise Heynderickx's songwriting saying "Heynderickx doesn’t write songs to present answers or offer confessions. She writes instead to pose puzzling questions: about herself, about her world, about God and reincarnated bugs and someone named Jo. That approach has made her one of the most promising artists to come out of Portland in the last few years, and it makes I Need To Start A Garden one of the most intriguing and immersive debuts of this young year." 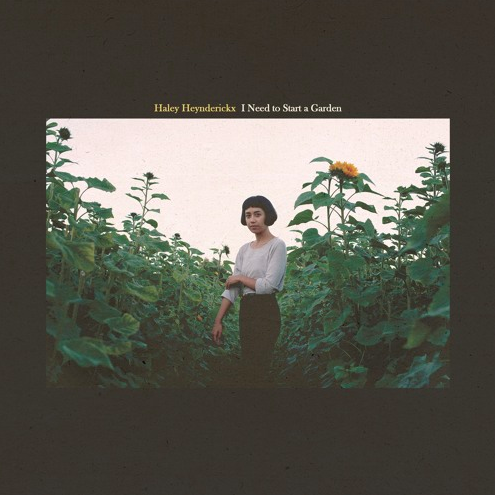 Stereogum summed up Haley's last single, "Worth It", by saying it "introduces mesmerizing guitar riff that keeps coming back among the peaks and valleys of raucous garage rock and soft contemplative hums" while Uproxx calls it "a perfect summary of Heynderickx’s songwriting strengths, as she deftly turns a cooing ballad into a towering, epic force, handling both sides of the spectrum — and everything in between — with grace." Paste think it's "sprawling, emotional" while NPR Music say "Heynderickx's songs have a way of sneaking up on you: They start out spare, animated by a lone voice or a subtly snaky guitar line, only to billow out into something strange, beautiful, bracingly intense." "Worth It" was picked up by MTV's TRL, the New York Times had a track review by Jon Pareles and Simon Vozick-Levinson recommended her first ever New York, which sold out, while AdHoc, Brooklyn Vegan, The 405 and Under The Radar, What Youth and Line of Best Fit all featured the single. Heynderickx recorded a live session with Paste and a NPR Night Owl session at the beautiful King County Distillery. Haley's "Worth It" was also the most discussed track on HypeMachine the week of release. Heynderickx uses her songwriting as therapy, a sort of mandorla to bridge the gap between -- whether it be between her mixed Filipino and American roots, or the dichotomy of her soft spoken nature and her vocal power. I Need to Start a Garden is full of pure bursts of humanity, in all their beauty and all their rawness, documenting anxiety, pain and conversely healing, community and creation. I Need to Start a Garden, will be released March 2nd, 2018 via Mama Bird Recording Co. with a Pre-Order available HERE. Mama Bird Recording Co. is a Portland, Ore. based record label committed to exceptional songcraft. Founded in 2011, their catalog includes acclaimed albums from Courtney Marie Andrews, Saintseneca, Barna Howard, Myriam Gendron and Vikesh Kapoor, among others.